How Much Do You Spend On Groceries For Your Family? There was an interesting threadjack the other day about how much people spend on groceries, and I thought it might make an interesting discussion for its own post. For those of you who track this stuff: HOW do you track your grocery spending? If you try to curb your grocery budget, what do you do — and how do you make sure you just don’t eat out instead? How many other people in the home notice or care when you’re trying to curb grocery spending? Psst: We always used to call money discussions “Tales from the Wallet” at Corporette — so we’re continuing the tradition here! 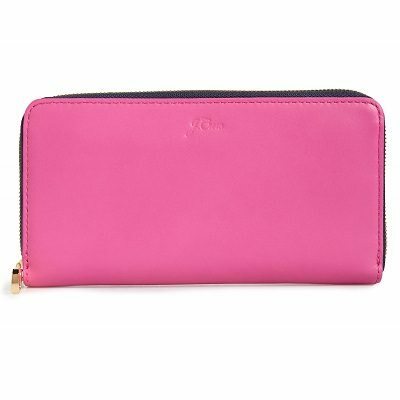 The above wallet is on a great deal right now if you’re on the hunt; it’s 50% off and down to $64 at Nordstrom. This post contains affiliate links and CorporetteMoms may earn commissions for purchases made through links in this post. For more details see here. Thank you so much for your support! Over to you, ladies — do you have a target for what you spend on groceries for your family? 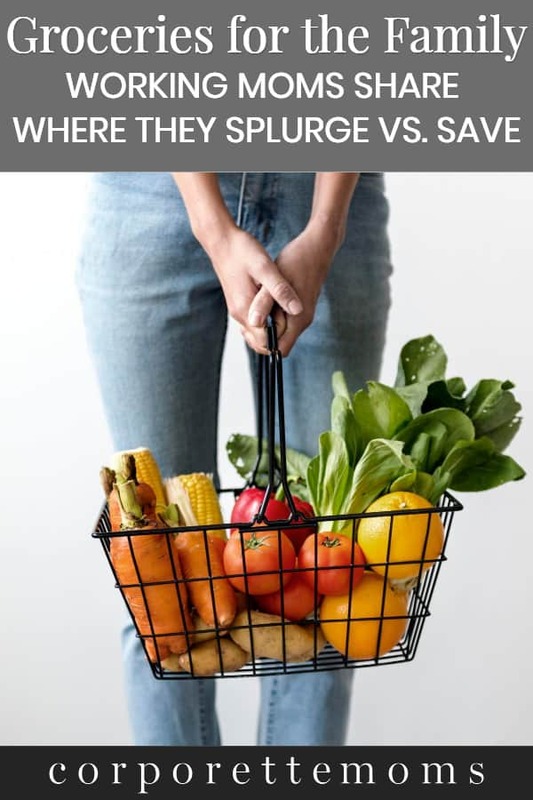 What are the best ways to save on family groceries that you’ve found — and what are the things that you’ll splurge on no matter what? Psst: I forgot that a friend recently shared a link to this Facebook album, which seem to be a Facebook version of the book Hungry Planet, which looks at what families around the world eat for a week. I generally track it in Mint, but the majority of our groceries come from Target and the Target/Mint interaction has been screwy the last couple months. I try to keep grocery purchases around $700/month (two adults, toddler, two infants who have just started getting purees) but that usually includes diapers/paper products/other Target miscellaneous. Our recent splurge has been more precooked meat. Our Target has a great selection of pulled pork/chicken, chicken/steak fajita strips, plain chicken breasts, etc. They’re more expensive and obviously much more processed, but for now it’s what gets a protein on the table after a few minutes in the microwave (or cold!). Two adults and one toddler here, all of whom are pretty picky eaters and have strong brand-preference (Daisy sour cream, Skippy peanut butter, Bounty, etc.). I probably spend on average $175 a week on groceries (we get them delivered weekly, which makes it easy to track if I wanted to, plus probably quarterly-ish trips or deliveries from Wegmans and Costco for things like family packs of ground beef (that I freeze in 1lb amounts), toliet paper, paper towels and other stable goods that are usually cheaper there), assuming there aren’t special events or parties I’m hosting – TBH my income is high enough that I don’t really track and if I notice the credit card bill is unusually high it’s usually due to too much eating out or takeout and we scale it back down. The biggest splurge items are probably milk (we go through 5 gallons a week), fresh flowers for the kitchen, meat, other drinks (when we’re not drinking milk, I’m a pop drinker and DH likes gatorade, pop or juice) and convenience food for the toddler (baby yogurt in single-serve containers, applesauce in single-serve containers or pouches, yogurt melts, chicken nuggets). We probably still get takeout or go out to eat 2-3x a week too; I bring lunch to work or have a catered lunch meeting most days. I keep a fully stocked freezer and pantry as a leftover habit from when we didn’t get groceries delivered and it could be 2-3 weeks between grocery trips for me – DH has expressed a preference that we try to keep less in the freezer as “that’s where food goes to die” and I’m working on my natural tendency to “hoard” ingredients in light of the fact that I cook so much less frequently than I did before we had kids and we have also committed to weekly grocery deliveries so it’s never that far away if I need something. I tend to freeze leftovers when I cook and then it will be 6 months (if at all) before I pull them out again, so trying to “eat down the freezer” is a current work in progress (and then not filling it back up again – maybe I will be able to fit my ice cream freezer bowl in one day again for homemade ice cream). We average around $800 per month for groceries for two adults and one tween girl, no alcohol or household items included. We pack most lunches, make our own coffee, and eat dinner out once a week. I splurge on prewashed and precut produce whenever possible–in effect, washing and chopping vegetables is the only task I get to outsource. When available, I also splurge on organic dairy (picky child will only drink one brand of organic milk), organic “dirty dozen” produce, and organic grains (because the Roundup thing horrifies me). Lately I’ve been trying to keep less food on hand “just in case.” I hate losing a freezer full of food in a power outage, which has happened to us before. Our pantry is small, and it gets overcrowded pretty easily. I will stock up when something we regularly use goes on sale. For example, when yogurt is on sale I’ll buy two weeks’ worth instead of just one. I have also been making an effort to use up specialty ingredients quickly instead of letting a zillion jars of different sauces and seasonings linger in the fridge. $100-150/week for two adults and a toddler in a HCOL area. So $400-600 a month? We barely ever eat out. I meal plan every week and that’s what we eat. Our meals aren’t fancy and we probably eat vegetarian 1-2 nights a week. Limited red meat, we mostly eat chicken or pork. Family of four, two adults and two boys ages 4 and 6. We spend about $200 a week at Whole Foods, but that includes groceries plus some non-perishables (paper towels, hair dye). No meat since we are vegetarian. I can’t figure out what we spend so much on but I guess it just adds up. About every two months, we go to the Indian grocery store and spend about $75 on lentils and basmati rice and spices. We cook lunch and dinner almost every day. As an aside, does anyone find that Amazon Prime has saved them money at WF? I can’t say that I see any difference. This is so topical! I just did our finances and saw we spent EQUALLY on eating out/takeout and groceries in January, which boggled my mind given the time and planning I give to meal prep & cooking. Generally, for me, DH, and 15 month-old DS we spend about $120-140/week at WF. I purchase based on what we are making that week and what the needs are. We do Costco quarterly, but mostly for nuts and sundries. Between WF, Amazon, and Rite Aid purchases, I am budgeting about $700/month for groceries and sundries. I guess our splurge is that we shop at WF, and buy a good amount of organic items. DS pretty much eats what we do for now, or I prep easy stuff with the basics we always shop for and have around, so I keep the kid-pouches and snacks around for travel or outings. DS gets most meals at daycare during the week. DH and I bring lunch to work 4 out of 5 days of the workweek, leaving a day open to grab something with a colleague (I am also going to lower that amount for myself after scary January). For Indian items (lentils, spices, etc. as Legally Brunette cited), I typically just ask my Mom to bring them when she visits or get them when I’m home as the quality tends to be better outside of the DC-Metro Area. After the scary January eating out/HH, I made a much lower budget for DS and I on those items. Like one poster said, we are fortunate to earn enough where it’s not a concern, but we are trying to save for an aggressive mortgage down payment, so I’m trying to pare down where we can. Our weekly budget is $125 per week for two adults and one toddler. I meal plan each week, so that typically includes all breakfasts, my lunch (usually leftovers from dinner), and dinner that we make at home 5-7 nights per week. We occasionally get a meal subscription such as Blue Apron or Plated, which is not included in that cost. We shop at a local grocery store, so the budget is only food and occasionally medicine or flowers. Most of our household products are purchased online from Target and Amazon. We try to buy high quality meat and purchase our milk from a local dairy, both of which cost more than typical options. I also buy freshly ground peanut butter with no additives from a machine at the store, which is pricey, but I eat it with apples as a snack throughout the week. I scan the grocery store’s ad every week, but don’t change the meal plan based on items being on sale. 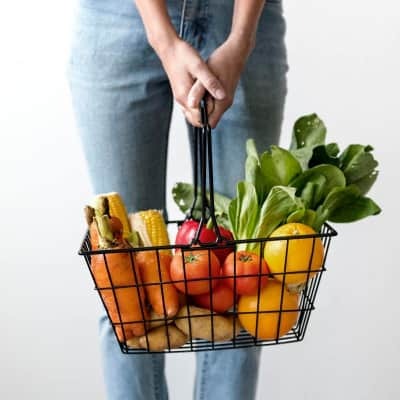 Instead I may add a fruit or veggie if it is on sale, or make a note to stock up on something we use a lot if it is on sale. The grocery list is saved in the Notes app on my phone and is shared with my husband so he can add to it. We usually stay on budget unless we are entertaining, in which case the extra food and alcohol typically puts us over that number. I keep our budget in an Excel spreadsheet, so that is where this category is tracked. 2 adults, 5yo and 2 yo. We’re somewhere in the $600-$700 range most months. We do cook most nights, pack lunch most days, do coffee at home, and if we have a meal kit subscription we count that as groceries. Some cleaning products/paper products are included there. We do a weekly grocery delivery, plus there’s usually a mid-week stop for milk and bread, since keeping a week’s worth of milk in our fridge means there’s not room for anything else. Right now we’re splurging on the meal kit subscription (we were in a recipe rut and needed to shake things up) and organic berries for the kids, because they eat so. much. fruit. We do a lot of pre-portioned snacks, to make lunch box packing easier. I will freely admit I have never tried to budget for groceries, because the savings seem so small compared to reducing major expenses like house and car, and we have more money than time so I’ll happily spend $4 for a frozen lunch entree vs having to pack a lunch. We spend a pretty high amount, well over $1000/month for two adults, a one year old (who I swear eats almost as much as an adult) and one dog. That includes diapers, paper products, dog food, and baby food. We buy organic milk and a lot of seafood, but otherwise not a lot of “fancy” food. We spend maybe $75/week going out to restaurants, which is usually one dinner and one brunch as a family. 2 adults, one teenager (au pairs, who generally eat more than my husband) and one grade-schooler. School prepares lunch, otherwise I cook/we have leftovers 5-6 nights a week, and my au pair and I eat all lunches at home, husband brings lunch 3-4 days a week. I’d say we probably spend about $1200/month on groceries split between Whole Foods, Trader Joes, and ShopRite. That includes paper products, cat food, cat litter, household cleaning supplies/etc. We got through A LOT of fresh produce, which adds up, as does the fact that I try to buy our meat/produce/milk organic. I also rarely buy ‘fancy’ cuts of meat, it’s generally pork loins, chicken thighs, and ground meat around here! We live in a HCOL area, and that number is on the higher side but it also went up by 30-40% easily when we added an au pair 3 years ago, teenagers eat so much more than I’d expected! We typically spend $700-$750 for a family of three – two adults and a three year old. Food/groceries are my splurge. I don’t spend a lot on clothes, help at home, house, car, etc. But I love to cook and really care about groceries. I could find ways to spend less if I wanted to, but I don’t want or need to. And, honestly, if I had to cut something out of my budget, I’d look at a lot of other things first. We spend $100-190 per week and that includes everything but beer – diapers, dog food, paper goods, toiletries, etc. Two adults and one two year old. We eat a lot of chicken, beans, lentils. We shop at a local grocery store, no Costco or WF. We eat out once a week. Approximately $1000 a month, on average over a year. But it can dip below or go above depending on when I schedule a large Costco run for meat. Household of six. Three adults (male Au Pair) and three kids. Big eaters. I budget ruthlessly and meal plan every weekend. I buy nothing full price and I cook fairly elaborate meals from scratch every night that provide leftovers for probably 75% of lunches for everyone. I shop first, meal plan second and design the meal plan around whatever is on sale. We eat a lot of meat and drink a lot of high end, expensive milk (which we also use to make our own yoghurt). No processed food. This week looks like this: Mon is Roast leg of lamb with mashed potatoes and gravy, carrots, green beans. Tues is homemade hamburger helper served with big green salad and homemade ranch dressing and crudité platter and homemade garlic bread. Wed is Sausages with roasted broccoli, beets, red onion served over quinoa and dressed in lemon goat’s cheese drizzle. Thurs is roast chicken and gravy with mashed potatoes, carrots, peas, red cabbage and cranberry sauce (all scratch prepared- so much cheaper. I hate repeats in one week but my kids requested more carrots and mash). Friday is lemon garlic shrimp risotto, steamed edamame and large green salad. Will you please elaborate on making your own yoghurt? I’d really love to do this but have never tried. It is hard to go back afterward. It is delicious. yum. and sigh. i miss cooking real meals. Those meals sound amazing! And with 3 kids – go you! Again, hard to track because of the Walmart/Amazon/Boxed/Costco/CVS/ Gas station(for some reason the gas station has the cheapest milk in town…), but for 2 adults, a 3.5 year old and 9 month old, I would say we average about 60/week, not including formula, which probably adds about 60/month to the budget. We pack our lunches for work, the kids get formula/meals/snacks for provided at daycare everyday, and we typically will eat maybe 2 or 3 lunches out per month. We don’t do organic, the produce around here is generally horrible to the point that frozen is the better option, even if I felt like paying 2.99/lb for broccoli. We also don’t eat a whole lot of meat. I grew up in a family where if it wasn’t on sale, unless it is a necessity, we didn’t eat it that week. On the other hand, I stock up on things when they are on sale. I find this helps with meal planning too. I generally follow this, use whatever online coupons I can find, and break the rules only for special events, or an especially good preschooler who helps me with the grocery shopping. Also, PSA, please always check your receipts. It is rare that I walk out of the grocery store without finding an error on the receipt. Drives me insane. But worth the effort in my book. I spend about $1000 a month for 2 toddlers and 2 adults. I budget in YNAB, so I track my grocery spending – but pull ups and other toiletries get in my grocery line item on occasion. Part of that budget is approx $35 a week for a CSA that delivers 10 months of the year. I could save by cutting that out – but I like the fresh produce and supporting local farmers. Grocery delivery actually saves me money because I am not tempted by random extras. However, I no longer get costco delivered by insta cart. Even if you are a member and order through the costco site, the insta cart prices are significantly higher than the store prices. The last delivery person accidentally left the real receipt with my order. I paid $250 through the service, but in store price was $190! So I’m back to doing one big costco trip a month. One thing I struggle with is buying meat. The costco prices are so good, but I feel an ethical responsibility to eat less meat. I try to buy “sustainable” meat when I do buy meat but constantly question whether that is truly a thing or if I am just paying a lot of money to assuage my guilt! I just checked Mint, and we spend about $600-800 per month on groceries. We have 2 adults and 1 kid. We make our own coffee and eat dinner at home most days–takeout or inexpensive restaurant maybe once per week, expensive restaurant (just me and DH) once a month or less. Lunch is included with Kiddo’s daycare, DH eats lunch at home probably 4 days per week, and I eat lunch at home probably 3 days per week. Tried to get a handle of overall budget for this year’s resolution, so tracking groceries in ExpenseTracker App. 2 adults, 5 kids (2 teens) — $1500 in January, $958 in February (plus $400 in eating out and $200 for school lunch buys). Rarely eat out, but almost daily food shopping, due to turnover, even with a stand alone freezer and meal planning.